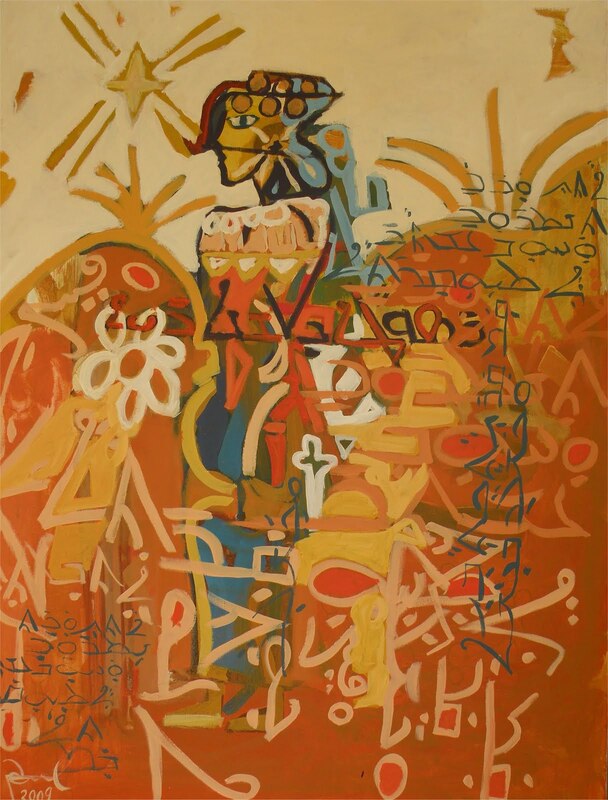 "Namroud Flower by Paul Batou"
While we are busy here in Modesto planning "A Riot of Assyrian Arts", the Los Angles Chapter of the Assyrian Aid Society of America has set "A Revolution of Assyrian Arts" this week which will reach its climax on May 8th, with a poetry night. We applaud the LA crew in particular Paul Batou a new rising star of Assyrian Arts. 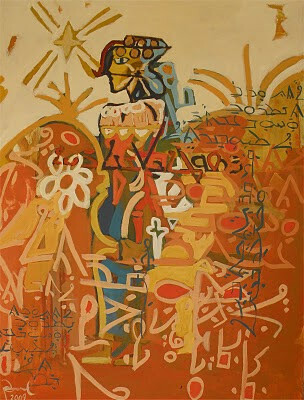 Los Angeles, CA – On April 26, Art Share Los Angeles will open its gallery to Artists & Art of Mesopotamia in Los Angeles. 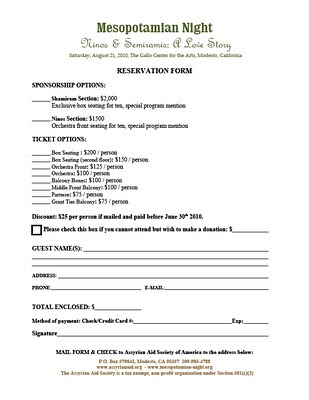 Sponsored by the Assyrian Aid society of Los Angeles, Artists & Art of Mesopotamia in Los Angeles is a series of art work are mainly collected by the Assyrian Aid Society. The Assyrian Aid Society is a non-profit organization that promotes Humanitarian Aid, Education, Music , and Art here in the United State as well as in Iraq ,Iran and others countries. This series of works features Chaldo-Assyrian artists from Iraq and Iran, the collection demonstrates not only the shared histories and cultures of the region, but also these artists’ passion for “freedom, peace, and democracy”. An artist’s reception will be held May 6th at 6:00 PM; the exhibit will be shown until May 16th. The gallery is open for viewing weekdays from noon until 6:00 PM. 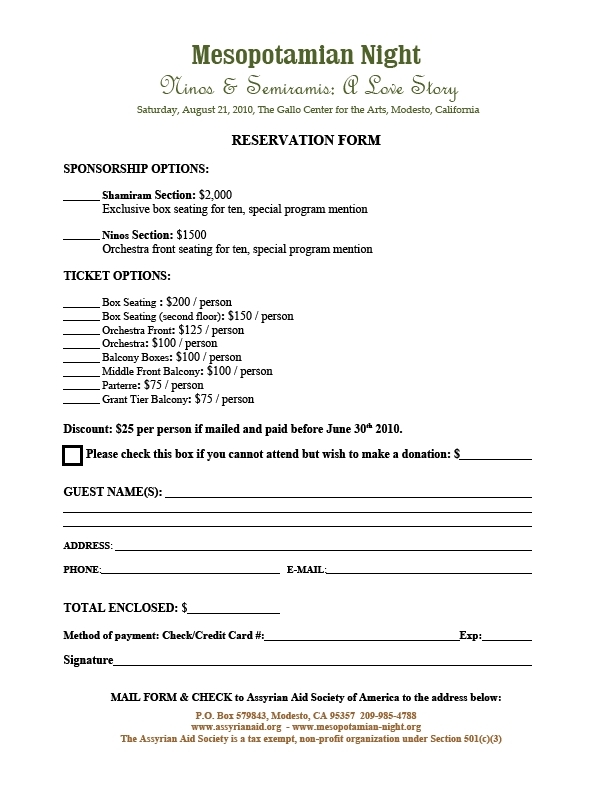 For more information, visit www.artsharela.org, or call 213.687.4278. The renovated warehouse space of Art Share is at 4th Place and Hewitt, with event proceeds benefiting free classes for teens, space for gallery shows, and low-income housing and a starting point for emerging artists. In addition to presenting Assyrian music in a form and shape not seen before, the Mesopotamian Night project has also been a hub to show case the Assyrian Visual Arts. A tradition that has been taken to another level recently by the Los Angles Chapter of our organization with their "Art and Artists of Mesopotamia" Gallery and Poetry Night. The clip below is a tribute to all of our artists who contributed to our art auction in MN-2009. In MN-2010 we will continue this great tradition and we invite our artists to participate. The special themes for this year would be "Ninos & Shamiram", "Nineveh", or any other topic of your choice. We Assyrians lost our original homeland a long time ago. In the following centuries, our path led us to all corners of the world, where we found new homes. Despite mountains of tragedy and strife cluttering our path since the fall of the Assyrian empire, and no matter where in history, we never lost sight of who we are, what we are, and where we come from. Nor did we lose our profound love, respect and appreciation for Assyrian arts. After all, a nation’s arts are parts of its identity. They are its soul. They remain so today for Assyrians the world over. That’s why I am ecstatic to see Mesopotamian Nights become an important center for the Assyrian performing arts. 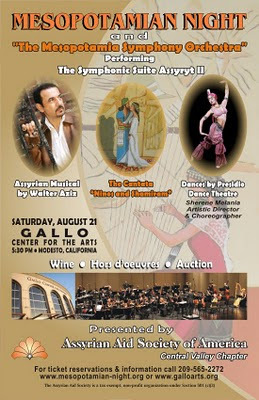 For the past four years, thanks to the sponsorship by the Assyrian Aid Society of America (AAS-A), Assyrian performing arts have exploded as more and more musical works are written, transcribed, arranged and, consequently, performed to carve our own niche in the international catalog of classical music and dance. Watching and listening as writer and master of ceremonies for Mesopotamian Nights, I am filled with pride knowing that if we had it once upon a time, we can have it again. All it takes is to throw open the window and let our arts spread wings. That all proceeds from Mesopotamian Nights performance and auction go toward helping our fellow Assyrians in Iraq makes the event so much more part of the Assyrian identity. This year’s program, as in previous years, is packed with a musical extravaganza fit for Ashurbanipal’s courtly celebration. From Assyrian opera to symphonic music, Broadway-style Assyrian musical to ballet, Mesopotamian Nights promises a dazzling feast of Assyrian performing arts. Please join me for a great evening of Assyrian music and camaraderie Saturday, August 21, at the Gallo Center for the Arts in Modesto, California. Thanks, and I look forward to seeing you. Assyrian pop singer and song writer Walter Aziz has joined the Mesopotamian Night 2010 project to take his nation’s music to a new height. He believes the struggle of our people to maintain their national identity is a priority and he uses his songs and music to help this struggle. His music strikes a chord in the hearts of young Assyrians everywhere with a modern sound and powerful lyrics. Walter was born in Baghdad, Iraq. He currently lives in San Francisco. Walter says, "I am excited about working on Mesopotamian Night 2010 project with Edwin Elieh. To present the Assyrian music in an orchestral format is a dream come true for me. This is a new project that creates more sophisticated interpretations of my songs. This is the ultimate in Assyrian music. I am so excited and will do anything to elevate the Assyrian music." We look forward to accomplishing these challenging goals. The Mesopotamian Night project team in 2009 initiated an annual "Mesopotamian Arts Award" program. The first award of this kind was given to Rabi Issa Benyamin for his contribution to Assyrian Calligraphy. The video clip below shows the speech of Rabi Issa Benyamin during the award ceremony. This tradition will continue to be part of our Mesopotamian Night events each year. The recent initiative by AAS-A LA chapter has given even more attention to this important part of our culture and we are proud that our organization has taken the leadership to be a friend and supporter of our artists, poets, musicians and writers. The video clip below is part of a series of interview presented in the Mesopotamian Night 2009 DVD. Obelit Yadgar is coming back again this year to help us with Mesopotamian Night 2010 musical. The success of our project in the past two years without his volunteer contribution, his educational articles and his interviews in Mesopotamian Night 2009, would not have been possible. We look forward to his contribution and creation of yet another successful historical Assyrian cultural event. The Mesopotamian Night Project team this year is bringing to the Assyrian audience an entirely new concept of Assyrian Musical. Thanks to Walter Aziz and Edwin Elieh who took the challenge and joined us to bring the concept of "Broadway" Assyrian Musical to reality in our upcoming Mesopotamian Night event in August 2010. 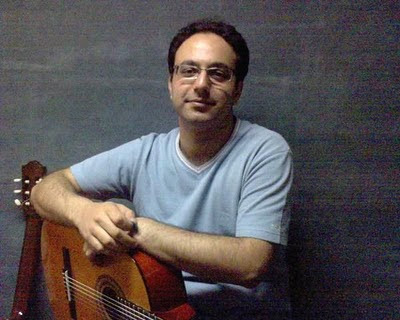 Edwin Elieh is an Assyrian musician from Urmia-Iran. He holds a bachelor’s degree in Music from Azad University of Tehran and currently is studying Film Scoring at UCLA. His composition style ranges from Classical orchestra to instrumental Rock and Pop music. Edwin writes in different genres of music and combines them to create a unique sound. He has been teaching Music and Guitar for over 12 years as well as singing and performing in numerous events. 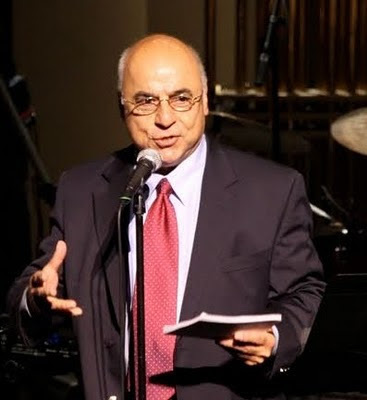 "Assyrian musical is a performance of Walter Aziz songs’ along with stage acting and dances. The arrangement and orchestration of the songs are based on dramatic and emotional message of each song’s story. Popular music uses lot’s of elements like repeating rhythm or chord progression that can be found in Minimalistic music. The challenge was the coloring most of the emotions that story is presenting along with maintaining the originality of the tune and rhythm pulse. Classical orchestra is a powerful tool assigned for this performance which will bring the life to each moment of the song." This video clip shows three pieces of Sooren's Music. They were performed at an annual dinner fund raiser of Assyrian Aid Society of America in Modesto California in February 2010. You could now get the updates about our projects and the upcoming events from facebook page at Mesopotamian-Night.org Facebook. 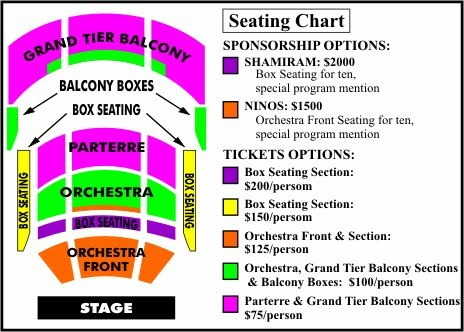 As we get closer to our fourth annual Mesopotamian Night concert fund raiser we saw it necessary to expand our reach and communicate more effectively with our audience and supporters.